Different from standard robots, collaborative robots, or cobots, aren’t designed to fulfil tasks in a fully automated, autonomous fashion. What makes them unique and what is simultaneously their biggest strength is their ability to physically interact with humans in a shared workspace. Human input is essential for a cobot to perform its tasks and this truly collaborative approach produces a better end result than either a human or a robot could have achieved on their own. Perhaps the industry with the largest amount of possible cobot applications, manufacturing is at the forefront of the collaborative robotics movement. 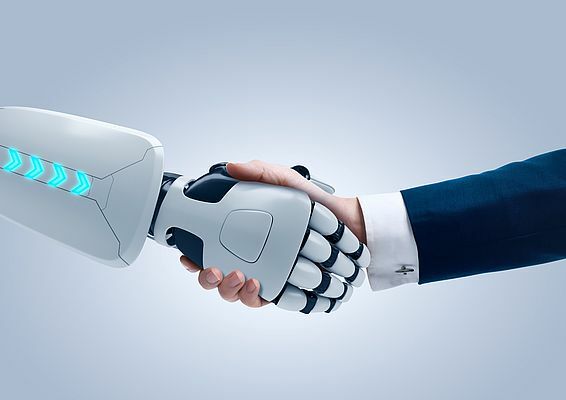 Due to their lower cost, small and medium sized companies can introduce collaborative robots without investing in the large industrial robots that big manufacturing businesses use as workhorses. Using cobots to perform a large variety of tasks such as working on delicate circuit boards, inserting parts into machinery or lifting heavy loads, the workspace of the factory becomes increasingly shared by humans and cobots. Warehousing, logistics and fulfilment are fields that are constantly racing towards deadlines. Innovative solutions in these sectors are largely focused on ensuring that products get from point A to point B as efficiently as possible. Crucially, cobots massively cut down on travel time in warehouses and, in a pick to cart environment, more than double the rate of units picked, increasing it from 90 to 200 per hour. Ranging from lab automation to neurosurgery to medical device packaging and beyond, the use of cobots in the healthcare industry has progressed significantly within the last few years. With the elimination of risk being a vital part of the industry, cobots need to be approved by governing bodies before they can be used. Increasingly, the benefits of collaborative robots are being seen in healthcare as they are being approved. Construction is one of the most dangerous industries for its workers – in the US, one in five worker deaths occurs in the construction industry. Collaborative robots can come to the rescue and change the face of the industry by significantly improving worker safety, taking on some of the more hazardous tasks like pouring cement. Oil and gas exploration has traditionally been high risk, high reward. Rigs are not pleasant working environments and thus increased automation as a form of process optimisation is not a new concept at extraction and heavy industry sites. Cobots are one way to address the isolation and danger faced by the sector’s workers. The agricultural industry benefits from cobots over traditional robots for two main reasons. Firstly, their force limiting capabilities come in handy when harvesting crops. Traditional robots are generally not used in harvesting in fear of damaging produce, however cobots’ more delicate touch can get the job done easily. Secondly, they are leagues ahead of robots when it comes to safety and the ability to work alongside humans and animals. In the automotive industry, flexibility is a major requirement – with cars becoming more and more customised, regular industrial robots that are often bolted down in cages and can only focus on one task are increasingly being switched out for cobots, whose applications can be changed with minimum effort. Law enforcement has some of the most flashy examples of cobot applications, and though collaborative robots in no way replace law enforcement employees, they almost act as assistant police officers. For one, remote controlled bomb disposal cobots take on risky work requiring high precision. Requiring a strong focus on hygiene, the food industry can rely on cobots to fulfil its specific needs. They can work in surroundings between 0 to 50 degrees Celsius and in low-oxygen environments and support human workers with repetitive tasks that require careful handling, like stacking eggs. Enabling smaller and medium sized companies to keep up with the fierce competition through increasing productivity, they are levelling the playing field and simultaneously providing a more interesting working environment for the workers that they collaborate with. The textile industry benefits from cobots in the same way that the manufacturing industry does, and their high precision makes them ideally suited for textile production and tasks like cutting materials or moving fabric parts without folding or wrinkling them. They are responsible for a significant reduction of human error, which in turn improves efficiency, and have truly made their way to working safely side by side with humans. Already adopted in a plethora of industries, it has become clear that the future of robotics is veering towards collaborative robots for all the reasons that lead to them being embraced in the first place: They are incredibly efficient, increase productivity, flexibility and safety, can be adopted for a relatively low capital investment and open up new working environments. Their popularity will only continue to grow as they work alongside humans, and their unlimited uses will be discovered and exploited across all industries before we know it.